When I awoke Thursday, I discovered bitcoin’s price had dropped nearly 5% over night. Although this week saw positive news for the currency, exchange BTC-E was quoting $596 per BTC. Earlier, Dell had announced that it would accept bitcoin on its online stores and BTC China announced that it would accept US Dollars and Hong Kong Dollars deposits. Not only was a brandname merchant accepting bitcoin, but the bitcoin economy had opened up to millions more. 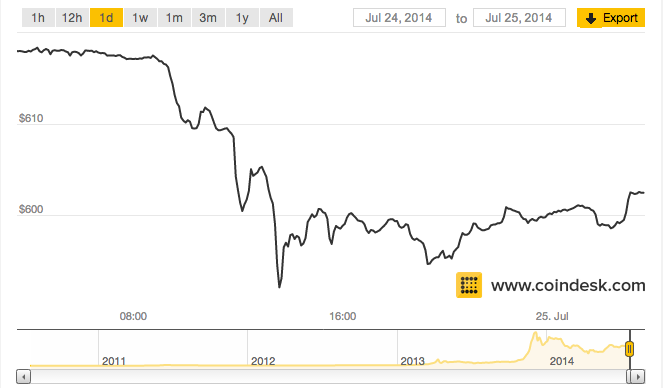 Bitcoin’s price wasn’t impacted. This may be a sign that bitcoin market is mature — just as tensions in the Middle East no longer cause price spikes in oil, mass adoption of bitcoin may now be fait accompli and built in its price. Sadly, the unexplained drop eroded my buying power. I first felt it at lunch that day. Since the beginning of the week, I’ve been on the hunt for healthy food that I could buy with bitcoin. My previous meals weren’t the healthiest – tacos and pizza. I was trying to uphold my living standard during the week and I was on a mission. My research led me to Gyft – an online service that converts bitcoin into gift cards that can be used at physical stores, such as Target. For lunch, I used the service to convert my bitcoin for a $25 Whole Foods gift certificate (at $604.59 per BTC). Normally this transaction would have completed within an hour, but today was different. I waited at Whole Foods feverishly checking the app over the course of an hour until I surrendered to a lunch-less day. I tweeted to Gyft about my troubles, but left the store defeated and hungry. Once back at the office, I learned that the quick deterioration of bitcoin spot prices had led me to underpay for the gift certificate and my order was held up. After a few more back and forths on Twitter and email, Gyft manually pushed my order. Two and half hours later, I received my gift certificate, but no lunch. By the time I got back to Whole Foods after work, I was ravished and feasted on beer and macaroni and cheese. Healthy food can wait. But the impact of bitcoin’s price drop impacted me again. Last Friday, I bought bitcoin from Coinbase at $629 per bitcoin, but by the time I received it was worth under $600. My purchasing power took another hit. Lesson learned. B itcoin living requires forethought. I didn’t take chances on Friday and ordered Thai food from Menufy for lunch. Daniel Long, Menufy’s co-founder, heard about bitcoin from a friend, much like others. He wanted to bring bitcoin payments to Menufy but found building a payment processor from scratch to be daunting and initially laid the plan to rest. However, when he heard about Overstock’s bitcoin integration, he knew it was time to look into bitcoin again. This time, however, he discovered Coinbase’s off the shelf payment processor. My stomach was thankful. While companies like Menufy and Coinbase make it easier for merchants to accept bitcoin online, the physical world still needs work. Merchant education and bitcoin’s value proposition needs to be refined. I spoke with employees of Cozzoli’s and Mai Thai — two Menufy clients — about it. Although the employees were curious, neither merchant actually knew that they accepted bitcoin and didn’t understand its benefits. They got paid out in dollars by Menufy and much to their customers’ chagrin, these merchants don’t accept bitcoin at the stores — only online. For these merchants, cash works fine. Ray Yusuf, a New York entrepreneur, is trying to convince merchants otherwise. His company Easybitz integrates bitcoin payment processors for a diverse group of merchants — from food trailers to high-end restaurants. Ray worked at his family’s newsstand growing up in New York and knew about the burdens of operating a brick and mortar store — sales, permitting, and back-end processing. To him, bitcoin not only eliminates back-end processes like dealing with credit card chargebacks, fees, and fraud, but also can introduce new consumers to the merchant. Although his data is still uneven, he sees bitcoin transactions increasing for his merchants, especially for those in Asia and Europe. After five days of living only using bitcoin, I am admittedly tired of cancelling dinner with friends, planning my meals in advance, and limited eating options. Bitcoin has promise, but its value proposition and infrastructure needs work. For it to take off as a currency, more merchants need to accept it, its exchange price needs to stabilize, and consumers must find real benefit in using it. I most likely will return to my cash and credit card ways, but I am still a bitcon believer and its potential not only as a currency, but also as a protocol. Here’s to the moon. Kaoru Fujita is the organizer of the @AtxFinTech meetup and the CEO of @guavatext.